Last song, Secrets and lies – Thoughts…. I have been reading a lot lately. I was kind off pushing me away from the books(novels) for about 3 months. I don’t know what made me do that. anyways that doesn’t matter… i am back in full swing. ..have been reading quite a lot since it is my Christmas holidays. 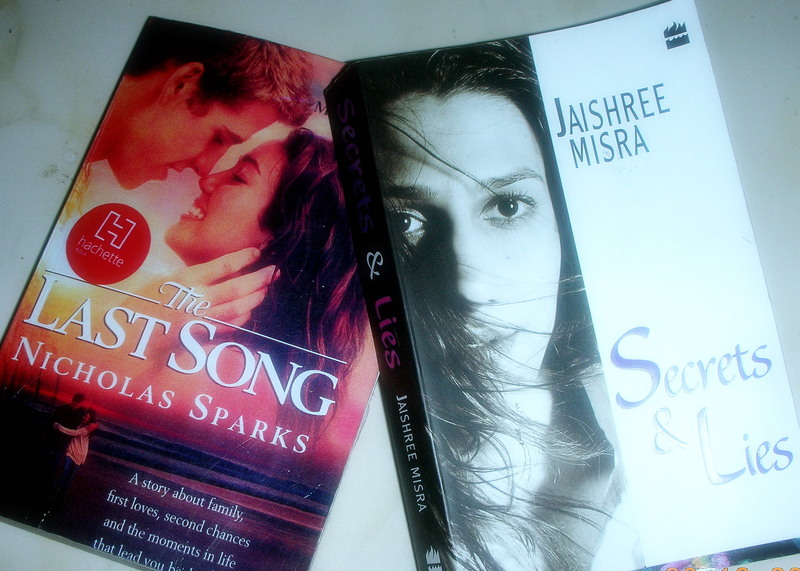 Read two books last week.. Last Song by Nicholas Spark and Secrets and Lies by Jaishsree Mishra..
Last song a typical Nicholas Spark book which has got its spark. I havent seen the movie yet. The book is good. ‘Ronnie’s character is strong and at some point i was able to relate her to a normal teen. ‘Will’ was as charming as he was supposed to be. Well, the story was good. But when i think back there is nothing remarkable. A girl going from a big city to a small town. Meets Mr. Charm falls in love and ya for a tragedy her dad dies and Mr.Charm goes to the city to do his higher education. They live happily ever after. One time read. Nothing much if you are looking for a serious book. Typical teen novel. I should agree that if i wrote this article soon after finishing the book my opinion should have been different. Secrets and Lies by Jaishree Misra. I like the writer as a person more than a writer. Her first book “Ancient Promises” was remarkable. Secrets and Lies a story about four middle-aged women who live different lives. They all were friends in school. You may find it hard to believe that the same writer wrote the book “Rani”. Okay I am being biased here. To this book. I liked it. Being a convent educated girl i could relate a lot of incidents in the book to my school life. Plot was perfect. Characters vibrancy and the style was lovely, still something was missing. Ending was not perfect. I would have liked it better with one more chapter. Just one more chapter would have clarified a lot of issues in my mind. I was not wowed by the book but i will surely read the book again.